My husband and I adopted our first cat, Snorkel, two years ago. Typical story of “going into the pound looking for a dog, and coming out with a cat.” Neither of us ever had a cat before, but for whatever reason that day, we were compelled to bring Snorkel back home. Perhaps it was because she cooed like a dove or that we learned of her sad kitten-hood. At the end of the day, we wanted to provide her with a home. Snorkel is a small gray domestic short-haired (tabby cat) with the most piercing emerald-green eyes. Fast forward a year and a half later, we adopted our second cat, Porkchop (a.k.a., Monkey, Mr. Bear, JibberJabber). 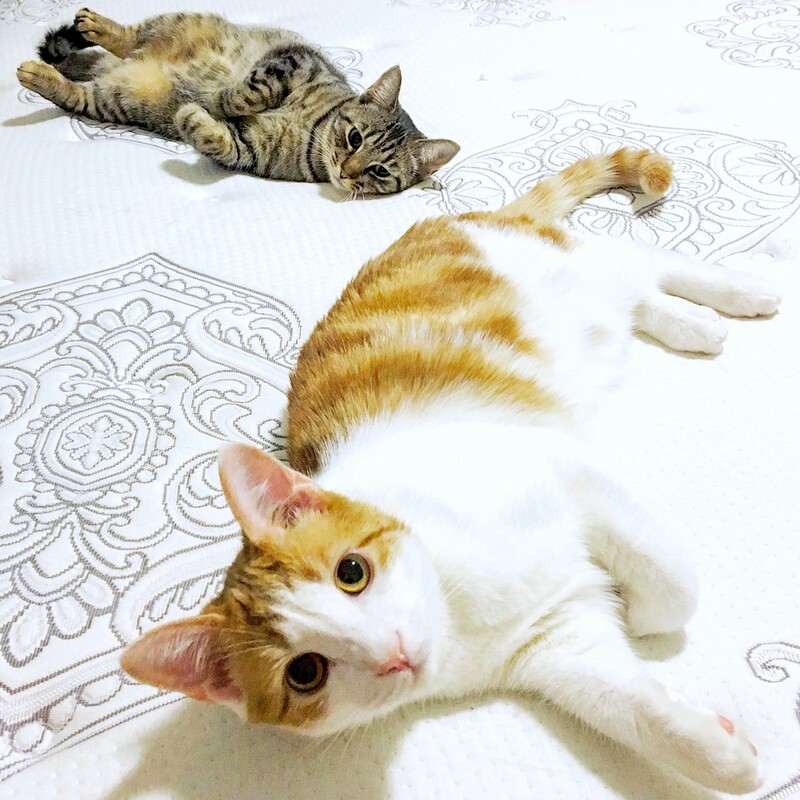 Porkchop is an orange and white cat and grew double the size of Snorkel in just 2 short months of living with us. We know he was raised with his litter and as far as we know, he’s was living in a caring foster home. These two magical kitties light up our home lives. If anyone knows about cats or pets in general, they are just bundles of love wrapped in fur and hours of 4-legged entertainment. What I had not expect was to learn life lessons from my loving fur babies who couldn’t be more different but were perfect for each other and who we love and appreciate in different ways. Lesson #1: Our past experiences will shape our motto, which will shape our behavior, which will shape our future experience — and repeat. Snorkel had a troubled early life. Without going into details, Snorkel’s history contributed to her temperament. She was very skittish, slow to trust and was the classic “scaredy cat” when we adopted her. She would scurry below the sofa at any sudden movement or loud noise. She was perpetually looking for a hiding place and in fact, did not leave her “base camp” bathroom for the first week she came home with us. Porkchop is the opposite in temperament. Where Snorkel’s motto is “I’m outta here,” Porkchop’s motto is ”Oooh! What’s that? !” There isn’t a new smell or shiny object that won’t pique his interest. We are easily shaped by are environment — our childhood, our family, our schooling experience. In our formative years (birth through ~8 years old), we begin to develop “mottos” that are then reshaped throughout our lives. Many of us evolve our mottos as we age and experience life. But often time, we will hold on to one or two mottos developed during our formative years, originally as a means to protect our little child selves now become a detriment to our adult life. For example, if someone in the playground once made fun of your hair and really hurt your feelings, you may have created a motto “don’t embarrass yourself” and lived by that rule for a long time. Perhaps that motto is holding you back from fully expressing yourself today or going for what you really want. Many of us are still carrying mottos created by a child that no longer serves us. If you find yourself living out an unhealthy or unbreakable “pattern” or “cycle” — you might want to ask yourself, what are the mottos deep inside you that have not evolved with your development? Porkchop is always right in the center of action ‘checking it out’ while Snorkel is leery of the unfamiliar and will stay on the sidelines. As a result, we find that Porkchop naturally gets more treats, play experiences and cuddles because he throws himself at new toys, new food, and his cat parents (yes, he runs right into our laps for attention). Because we love both of our cats, we make sure Snorkel gets her needs met as well. But life for humans doesn’t always work this way. Opportunities are all around us and it’s really up to us how we choose to show up and react to our surroundings, which creates what we experience. We have noticed that ever since adopting a brother for Snorkel, she has shifted her behavior– such as trying new food / treats, going into a crate (for play), being more confident around new people. It’s a theory, because my cats are still learning English, but I believe Snorkel learned by observing her brother that some of her earlier assumptions really didn’t serve her. Or probably more likely that she wanted what her brother was experiencing (food, fun and attention) so she modeled his behaviors. Do you have pets? What have your furry companions taught you? I would love to hear your thoughts! If you enjoyed reading this article, gimme a lil heart!